Chapter Board Member Profiles : Old Profile Terms updated and New Member Profiles Uploaded. Synergy : Published TOC & PDF Version of Synergy - Issue 07. Visit Synergy - Issue 07 to read. Chapter Bylaws : Chapter Bylaws 2012 uploaded to chapter website. Visit Chapter Governance page. Chapter Event : Published event Managing Troubled Projects - In collaboration with IBM. Chapter Event : Updated event 2012 Chapter AGM. Chapter Event : Published event 2012 Chapter AGM. Chapter Event : Published event Project Management - Structuring Projects To Ensure Success with Asia-Pacific Institute of Management . Bug Fix : Bug Fix in Chapter Member Data Enquiry application. Career Opportunities : New Career Opportunities with PMC Company Position. Visit Career Opportunities Section for more information. Synergy : Published TOC & PDF Version of Synergy - Issue 05. Visit Synergy - Issue 05 to read. Career Opportunities : New Career Opportunities with CSC, India Position. Visit Career Opportunities Section for more information. Chapter Event : Published event Workshop on Project Management â€“ Infrastructure & IT Projects . Synergy : Published TOC & PDF Version of Synergy - Issue 04. Visit Synergy - Issue 04 to read. Chapter Event : Published event Project Management and Agile:Evolution of Agile . Chapter Event : Published event Project Management - Infrastructure & Information Technology - In collaboration with ESIC. Renew Membership : Added link to quick membership renewal utility by PMI. Membership Status : Added Membership Status utility for Website Visitors. Now its easy to enquire the current PMI North India Chapter Membership status. Visit Membership Status Page to read. Chapter Events : Published and updated Project Management in Cloud Computing event information. Visit Event Page to read more. Chapter News : Updated Chapter News Section on Home Page. Visit Home Page to read more. Synergy : Added placeholder and links for Synergy, under Knowledge Center Menu Option. Visit Home Page to read. Synergy : Published Online Version of Synergy - Issue 02. Visit Synergy - Issue 02 to read. Synergy : Published Online Version of Synergy - Issue 01. Visit Synergy - Issue 01 for more information. Chapter Home Page - Slide Deck : Updated with PMI NIC Newsletter - Synergy News and Links. Visit Home Page for more information. 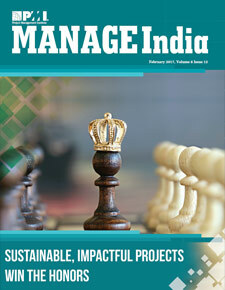 Chapter Home Page - Slide Deck : Updated with Manage India Cover Story and Chapter News in Manage India content and Links. Visit Home Page for more information. Event Update : Agile Certification Training Workshop Postponed. Visit Home Page for more information. Navigation Menu : Added Non Chapter Events menu item to Events and Activities, to provide information on events being conducted by other providers, but benefit can be availed by a chapter member. New Event Announced : Agile Certification Training Workshop announced. Visit Home Page for more information. Chapter Home Page - Slide Deck : Updated with West Bengal Chapter Launch News and Project Management Research & Academic Conference Details. Visit Home Page for more information. Chapter Home Page - Collapsible Info Boxes : Added Chapter in News for quick reference. Visit Home Page for more information. Chapter Home Page - Collapsible Info Boxes : Update PMI in News content. Visit Home Page for more information. Chapter Home Page - Slide Deck : Replaced Event Information with Manage India Cover and Feature Story Links. Visit Home Page for more information. Career Opportunities : New Career Opportunity for Java Architect Position. Visit Career Opportunities Section for more information. Navigation Menu : Renamed PMI Manage India menu item to PMI India, and included list of other PMI Chapters in India. Chapter Home Page - Social Media : facebook is now the default visible widget. Visit Home Page for more information. Chapter Home Page - Slide Deck : Updated links and information regarding PMP® credential update. visible widget. Visit Home Page for more information. Chapter Home Page - Collapsible Info Boxes : Added PMI in News and Certification FAQs sections for quick reference. Visit Home Page for more information. Chapter Event Message : Updated 5th Feb, Chapter Event Agenda, Speaker Profiles and PDU Information Visit Event Page for more information. Chapter Event Message : Added 5th Feb, Chapter Event Message to Slide Deck. Visit Home Page for more information. Photo Gallery: Created a new Photo Gallery for PMI North India Chapter Presence at PMI India PM Workshop at Lucknow Visit Photo Gallery for more information. Republic Day Message : A message carrying Republic Day wishes added to the website. Visit Republic Day message. Home Page : Introduced Events Collapsable Box, to display upcoming chapter events. Visit Home Page for more information. Career Opportunities : New Career Opportunity with a Top FMCG. Visit Career Opportunities Section for more information. Home Page : Introduced Career Opportunities Collapsable Box, Clubbed twitter and facebook, in tabbed manner. Visit Home Page for more information. Career Opportunities : PMI North India Chapter collaborates with organizations seeking talent to extend Career Opportunities for Members. Visit Career Opportunities Section for more information. Google Search : Its much easier to find content on our website now, we have enabled Google Custom Search for www.pminorthindia.org. Please bear with us, while Google updates its Search Indexes. PDU Events Calendar : Its much easier to find upcoming events now! We have added a new page which lists 10 upcoming PDU Events. You will still be able to see the entire calendar, by following the link provided on Upcoming PDU Events page. New Chapter Website : We launch our Chapter Website as per PMI Guidelines, becoming the first in the region to do so. The following image depicts the transformation chapter website has undergone.